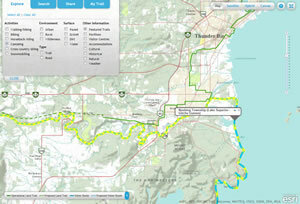 Developed by Esri Canada Limited, the application at tctrail.ca/ maps a 16,800-kilometer network of interconnected trails. The Trans Canada Trail stretches from St. John's, Newfoundland, west to Victoria, British Columbia, and north to Tuktoyaktuk, Northwest Territories. By the time Canada celebrates its 150th anniversary of confederation in 2017, the completed Trail—built by volunteers—will total 23,000 kilometers and link more than 1,000 communities. 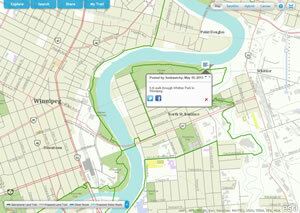 It will be the longest multiuse recreational trail in the world. 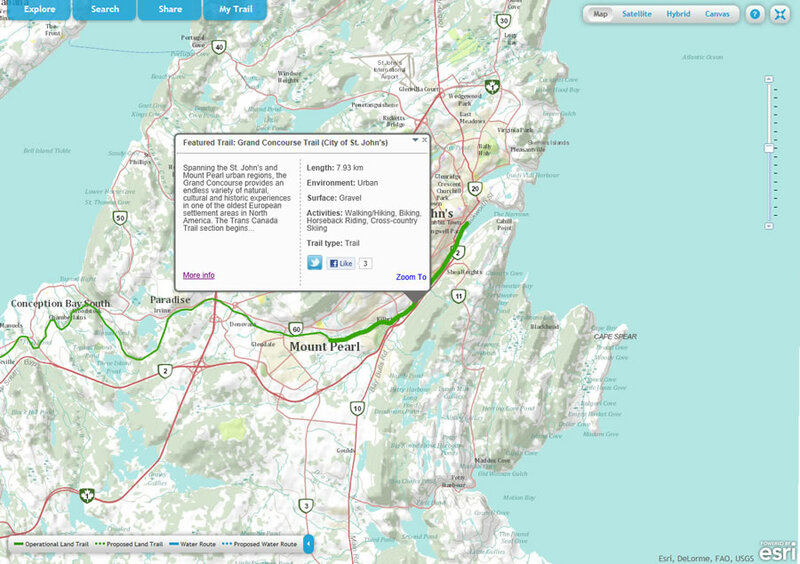 Esri Canada donated the app to honor its commitment as a member of Chapter 150, a circle of visionary and philanthropic business leaders that have joined forces to support the Trail's development. 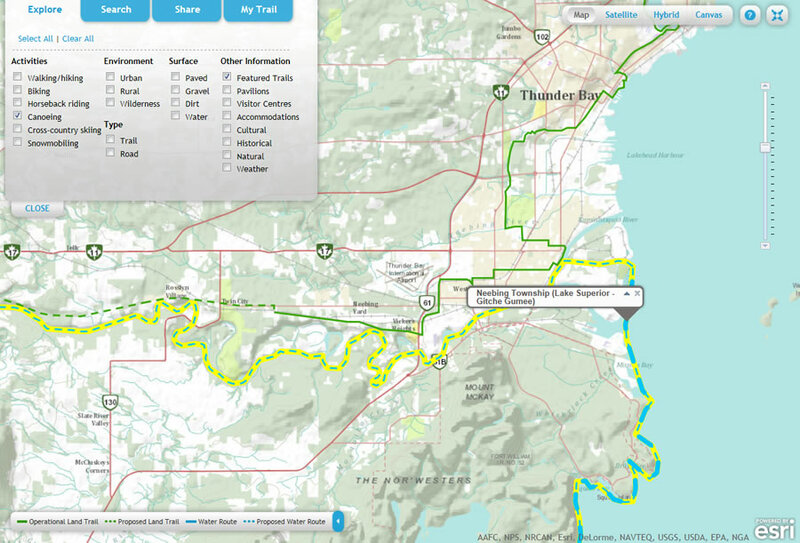 "Building the Trans Canada Trail is a significant achievement for Canada, and we're proud to be part of this historic journey," said Alex Miller, president, Esri Canada. 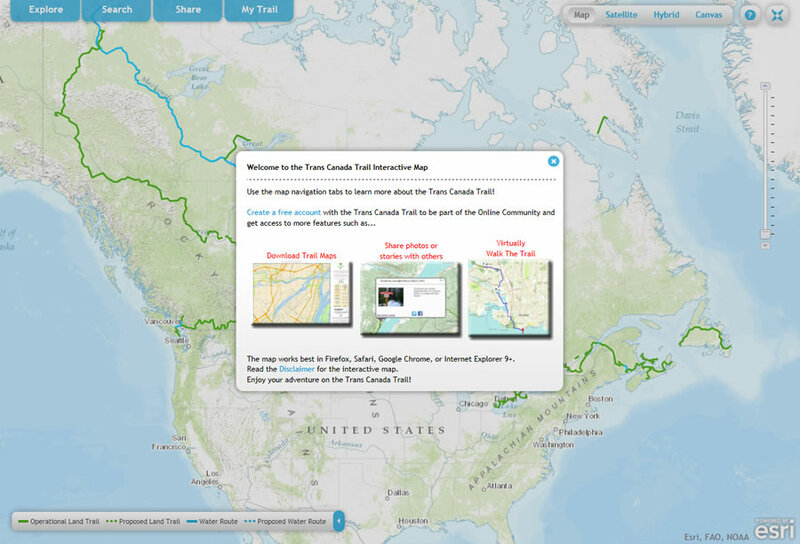 "In the same way that the trail connects Canadians, our purpose for creating this web map is to give them a collaborative platform to connect through their trail experiences and help preserve our national heritage." In Whitehorse, Yukon, the Whitehorse Copper Trail is the main line of the Trans Canada Trail, running through a copper belt last mined in the 1970s. 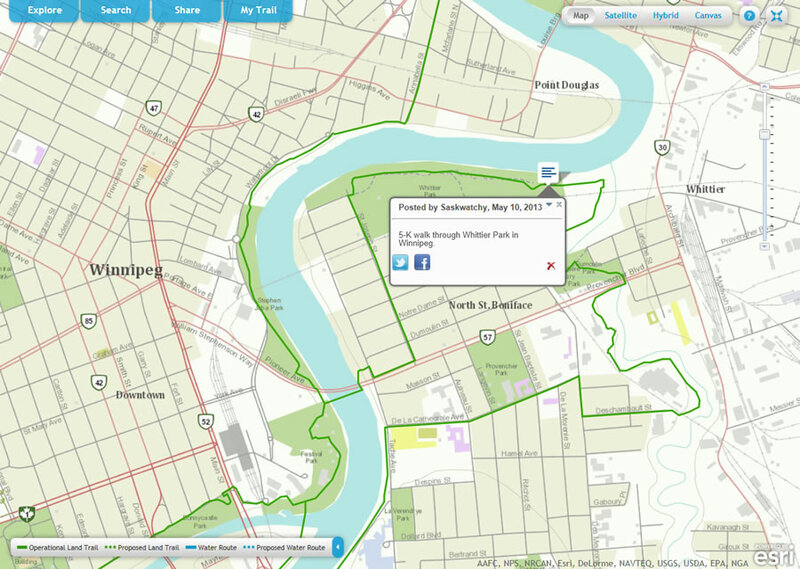 The Trail connects many of the major multiuse trail areas in and around the city and provides a paved surface that's ideal for walking, hiking, and cycling. 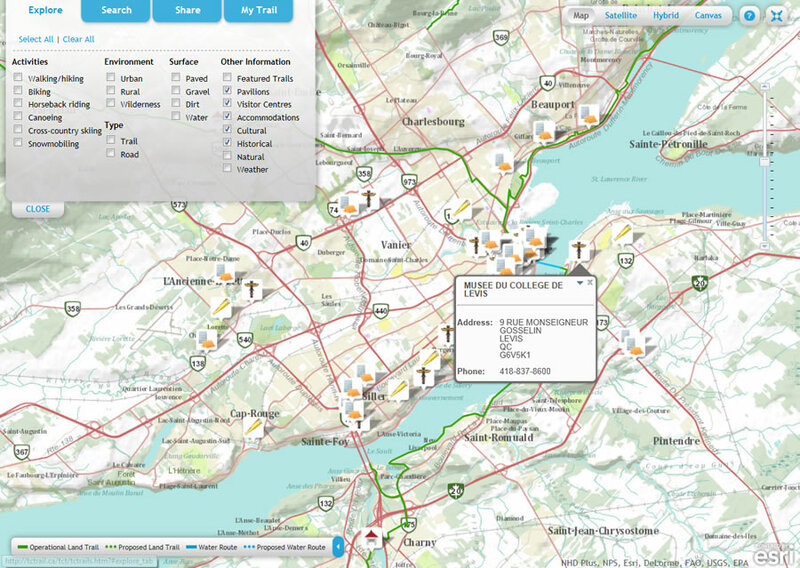 "This online map makes the Trans Canada Trail accessible to Canadians and our many international visitors," said Deborah Apps, president and chief executive officer, Trans Canada Trail. "Before venturing out, they can use the map to choose the best Trail section for the activity they have in mind. Or, if they are visiting a new part of the country, they can locate the section closest to them. 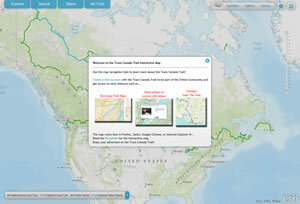 The interactive aspect of the online map also lets Canadians share their experiences; our map is one more way that the Trans Canada Trail connects Canadians from coast to coast to coast." 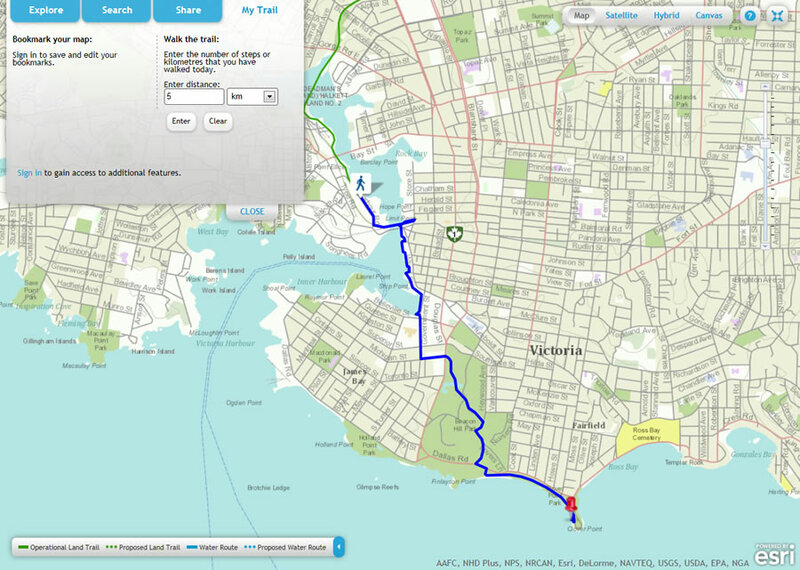 "The cartography used resembles real topography, which is very intuitive for hikers and outdoor enthusiasts," said Matt English, technology lead, Esri Canada. "We wanted to create an app that was simple to use, attractive, and clean and would mimic the actual Trail as closely as possible." 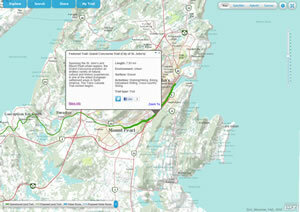 The app's ability to integrate crowdsourced data lets users share photos and stories about their experiences on the Trail. Across Canada, users are documenting their bike rides, hikes, runs, and cross-country skiing adventures. For example, a group of senior citizens in Saskatchewan posted a story on the map, near the village of Macrorie, that said they had completed several weeks of walking the Trail, an "exciting and interesting" experience. A hiker in British Columbia reported that he had hiked up the lower part of the Trail from Caulfield, West Vancouver, and was planning a nine-kilometer hike to the Cypress ski area. People have posted beautiful photographs on the map, including pictures of the world's longest covered bridge in Hartland, New Brunswick, which stretches 391 meters (1,283 feet); a family of deer sloshing through a stream in Alberta; and paddlers on the South Saskatchewan River. The Trans Canada Trail/sentier Transcanadien is a national nonprofit organization that supports the development and use of a national network of trails that links millions of Canadians from coast to coast to coast. Canadians and international visitors use the Trail to hike, cycle, ski, horseback ride, canoe, and snowmobile. Partnering with all levels of government, donors, and partners, the Trans Canada Trail supports the work of more than 400 local Trail organizations and thousands of volunteers across the country through Trail development grants and the promotion of their efforts to build and sustain one of the world's longest and grandest recreational networks of trails. 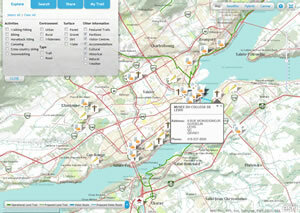 For more information, visit tctrail.ca.